The Friends of Francis Field will hold its Annual Membership Meeting on April 24, 2019, in the new lobby lounge of 2501 M Street NW. This evening meeting has traditionally been part social and part business, with a slide presentation of the group's past year and plans for the year ahead. The guest speaker this year will be Nicole Goldin, the newly elected member of Advisory Neighborhood Commission 2A, who represents the single-member district in which Francis Field is located. The meeting is open to the public, although only FFF members in good standing may participate in the voting for the corporation's Board of Directors. There will be a "meet and greet" session beginning at 6:30 pm; the business part of the meeting will be held from 7:00 to 8:00 pm. The agenda in PDF format is on this website. Members who wish to vote should be sure that their dues are up-to-date; this can be done by credit card on the secure PayPal system. See the "About FFF" section of this website for the link. There is also a form there that can be printed out and mailed. We also invite prospective members to consider joining our organization at this time. This can be done with the same form mentioned above ... see "About FFF." 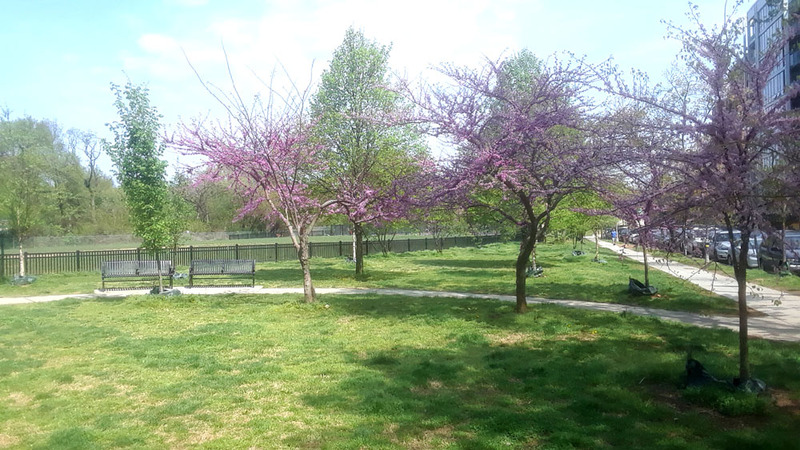 At its February 21st meeting, the Foggy Bottom/West End Advisory Neighborhood Commission (ANC-2A) voted unanimously in support of the revised master landscape for Francis Field, a public recreation space in the West End, located on 25th Street NW, between M and N Streets. 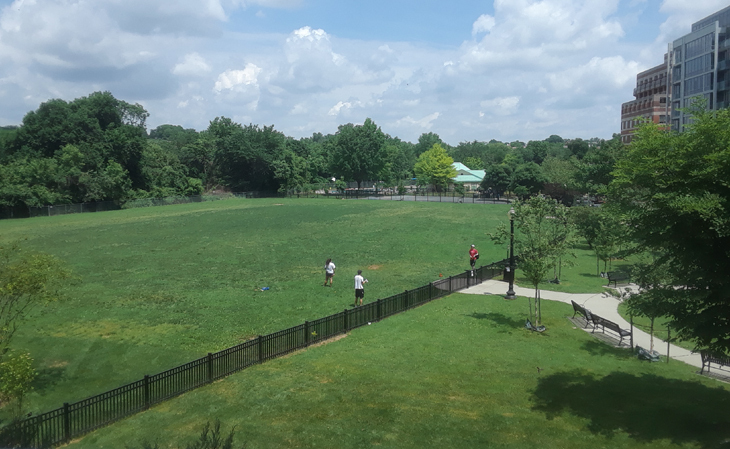 The new master plan (shown below) has been developed in accordance with a 2018 partnership agreement between the D.C. Department of Parks and Recreation (DPR) and the Friends of Francis Field (FFF), a non-profit organization that is improving the field with private funding. The photograph at left shows the state of the field in May 2018, after FFF completed a year long experimental "greening" program that involved planting trees, planting grass, and temporarily irrigating the field to allow the grass and other plants to thrive. While the new master plan does not contemplate major additions or changes to the field, it updates the 10-year-old original master landscape plan, which was developed by FFF during a 2007 zoning case, and approved in September 2009 by DPR and the U.S. Commission of Fine Arts (CFA). Review of the new master plan by stakeholders, neighbors, and the Advisory Neighborhood Commission, was begun on December 4, 2018, when the revised plan was made public. It was put on this website in January 2018, and explained more fully in a series of articles. A link to the most recent is at the end of this page. The full ANC-2A resolution is on this website. The next step in the process will be a review of the plan by DPR, which had a change in directors in January. Acting DPR Director Delano Hunter has acknowledged receipt of the ANC resolution and has stated that he will be reviewing it with his DPR colleagues. Mostly, the new plan documents changes that were made since 2009, including the addition of the Francis Dog Park in 2015, and the expansion of the 2501 M Street building at the south end of the field in 2016 and 2017. The new landscape plan, shown at right, was drafted by the professional landscape architecture firm, Oculus, which also developed the 2009 plan. FFF has funded the architectural work, and according to the DPR-FFF agreement, will also fund the improvements, which are mostly landscape plantings. Other changes and improvements include two water hydrants added in 2017 and the proposed removal of an obsolete irrigation valve. A larger view of the plan is on this website in PDF format. The labels for new features can be seen more easily on this large version. See 2019 Master Plan PDF. Approval of the new plan rests with DPR, under the existing agreement. Once DPR gives its approval, the plan will be submitted to the CFA, a federal agency that has jurisdiction over parks, buildings, and monuments that can be seen from federal facilities. A large western section of Francis Field is a part of Rock Creek Park, a national park. A comprehensive explanation of what would be changed on Francis Field according to this plan—and why—is provided in an article on this website. 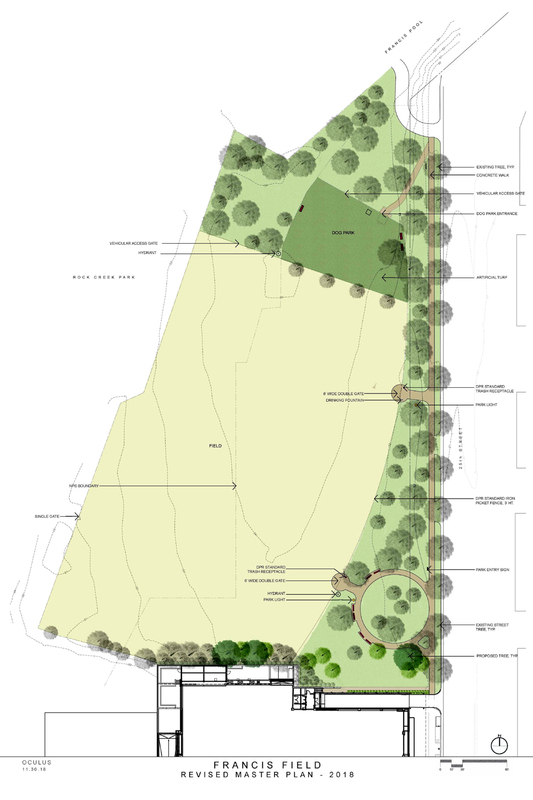 See Francis Field Master Plan Changes Explained. Copyright 2019, Friends of Francis Field.